Chicago NOW marched and tabled at the 2017 Dyke March at Piotrowski Park. March organizers, bands and speakers took to the stage while NOW representatives spoke to scores of participants who stopped at our table. The day was filled with community and information sharing, but was also dotted with some protests. Located close to the Chicago NOW table, religious protestors harassed march attendees shouting hate speech. Fortunately, organizers and attendees joined together to form a human chain while a drumming band came along to drown out the hateful words. Soon after the protestors left. Unbeknownst to Chicago NOW, three people were told to leave the march because of a rainbow flag with star of David on it being carried by one of these people. 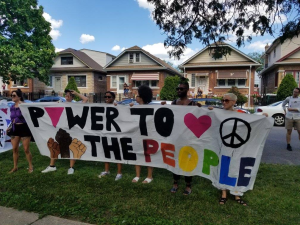 Through multiple press outlets after the event, Chicago NOW discovered the political controversy regarding the pro-Palestian, anti-Zionism of the Dyke March organization platform. In defense of the action taken the spokesperson for the organizers stated the platform rules and that those who were confronted and asked to leave were members of a group that were pro-Zionism and therefore made others in the March feel unsafe. We at Chicago NOW state our commitment to religious freedom and all people are allowed freedom of expression within our events. We will not allow anti-Semitism to be an exception. Give Your Choice A Voice Part 2?? ?